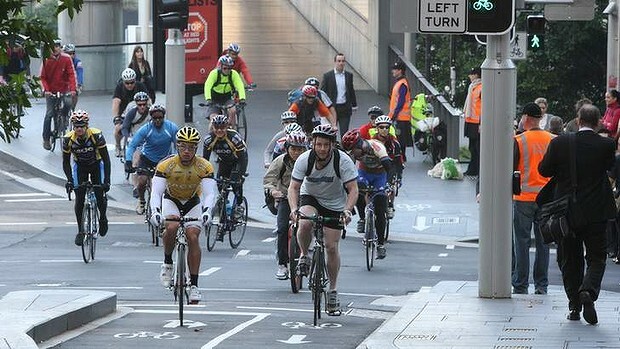 The federal government wants to increase the number of people who make short trips by foot or bicycle after a report card on the performance of Australia's cities found rapid changes in the labour market would pose big challenges to transport infrastructure. The government has agreed that, where practical, all future urban road projects must include a safe, separated cycle way. "For shorter trips we need to get more people choosing alternatives to the car," Mr Albanese said in a speech. "People will walk or cycle if it's safe and convenient to do so." The economic benefits of riding and walking to work include better health, less congestion, reduced infrastructure costs, reduced greenhouse gas emissions, better air quality, noise reduction and savings in parking costs. The government also released the State of Australian Cities 2013 report, which said changing workforce patterns ''would pose major challenges'' for transport infrastructure planning. "Connections between the places that people live and where they work in major cities are important to their productivity and also to equality of opportunities," the report said. It found that higher-skill, higher-paying jobs were increasingly concentrated in central areas of cities. Job growth tends to be lowest in the outer suburbs of Sydney and other big cities. "This means that more and more workers are facing long commutes to get to work," Mr Albanese said. "This limits the productive capacity of highly skilled women who can have primary responsibility for children and ageing relatives. The report finds they are more likely to accept a poorer-quality, lower-paid job closer to home. This is particularly evident in newer suburbs." The report drew attention to the high cost of parking in Australian cities. Sydney was recently ranked the third most expensive central business district in the world in which to park a car. The report also warned that extreme weather events, especially heatwaves, would take a bigger toll on cities in future. The report forecast the number of annual heat-related deaths in Sydney would climb from 72 to 129 between 2011 and 2050 - a rise of 80 per cent. "Those at highest risk from heatwaves include the elderly, the socially disadvantaged such as those on lower incomes or the homeless, and those with underlying medical conditions," it said.